Do you have a project that needs programming skills and knowledge that are not currently available to your developer or team? I will consult with your designer, developer or programming team to provide the programming skills that your team needs. Your company's designer or advertizing agency may have created an excellent website, but you may want some functions or features that require custom web programming skills that may not be available from your designer or agency. 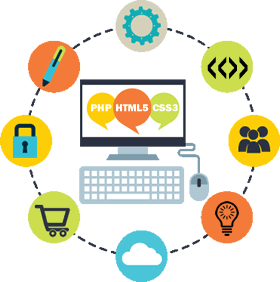 I'm happy to work with your existing team in order to create the custom website programming that you need. I can either work as a consultant, or I'm happy to program entire sections of your code, using your existing site design. I can build and include databases and the queries to access them. I can add AJAX capabilities to your new or existing pages. I can add interactivity and real-time updates of data on the page, without requiring a page refresh. I can evaluate your existing coding infrastructure, and make recommendations on how to improve it, or you can commission me to actually perform the updates. I can bring a new perspective to your project from the viewpoint of an experienced coder who also has business experience. If you are considering building a new website, updating a current website, or you are working on a project under development, you could benefit from experienced outsiders view of your project. You could save thousands of dollars by getting a realistic overview of the requirements of your project and the steps necessary to effectively complete it. New developments in the web programming industry have revolutionized our ability to create interactive websites that are responsive and work well on all devices. You may be working with old technology. There may be new methods available that can dramatically cut the cost of your project. Your current developer may be making recommendations that are not in your best interest. By bringing in an experienced consultant to analyze your site or project, you can make sure that your resources are being used effectively, and you will understand what is required to get the results that you need.